With the mindset of having nature like environment, people have decided to go the artificial way. This is by making greenery like items, which completely resemble the kind of plant or flower that one prefers. Since live flowers may at times be contagious, poisonous or rather have unfriendly pests & insects, artificial succulents could be the best solution. Artificial succulent Bonsai are among the most preferred, bearing in mind that there are 50 plants families which are considered succulents. Also being found in almost every part of the world makes them be known by many, not to mention their beauty. The love of custom artificial succulents is mostly derived from their ability to retain water in arid climate areas, places that have various soil conditions. 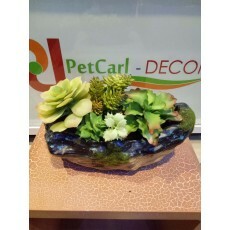 Artificial succulents are very hard to distinguish from what nature offers, without touching to determine the texture. This is why many people go for succulent, to have a touch of nature around the house.